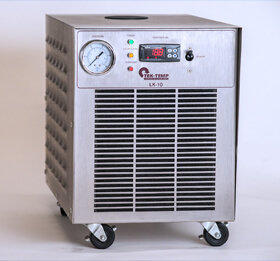 When external heating of your sample or equipment is required, the economical, compact designed LK-10/NRH series heating recirculator is the ideal choice. Designed for table top or floor usage this heating unit provides all the features required for temperature control and clean circulation. 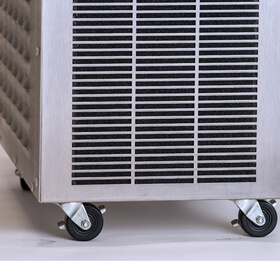 The unit comes standard with a stainless steel cabinet for easy cleaning and durability. 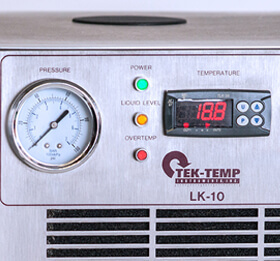 The LK-10 utilizes heaters with capacities of either 1000 or 2000 Watts. Our optional PID microprocessor controller will improve stability to ±0.1°C and features simultaneous display of process temperature and setpoint. The controller front panel keys may be locked for security. The recirculating fluid pressure and level status are also displayed on the front panel. To facilitate computer control and data logging, the LK-10/NRH may also be equipped with a digital communications interface.